Storing hazardous substances is a process that entrails high risk, and in which many resources are spent in the planning of safety measures; however, safety could be included at the initial stages of the design of this type of installations, by optimizing the number of tanks that are used to store the substance. The effects and consequences of major accidents are directly proportional to the mass of materials involved in them; therefore, if the mass was divided in more containing units, the consequences at the moment of an accident occurrence would be lesser. However, as more units are used to store a dangerous substance in an installation, the risk of domino effect occurrence at the moment of an accident also increases. 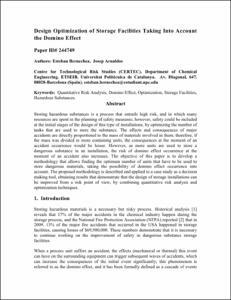 The objective of this paper is to develop a methodology that allows finding the optimum number of units that have to be used to store dangerous materials, taking the possibility of domino effect occurrence into account. The proposed methodology is described and applied to a case study as a decision making tool, obtaining results that demonstrate that the design of storage installations can be improved from a risk point of view, by combining quantitative risk analysis and optimization techniques. Bernechea, E.; Arnaldos, J. Design optimization of storage facilities taking into account the domino effect. A: 2012 AIChe Spring Meeting & 8 th Global Congress on Process Safety. "Conference Proceedings (CD). 2012 AIChe Spring Meeting & 8 th Global Congress on Process Safety". 2012, p. 104-115.